Happy Christmas to all my reader here !! 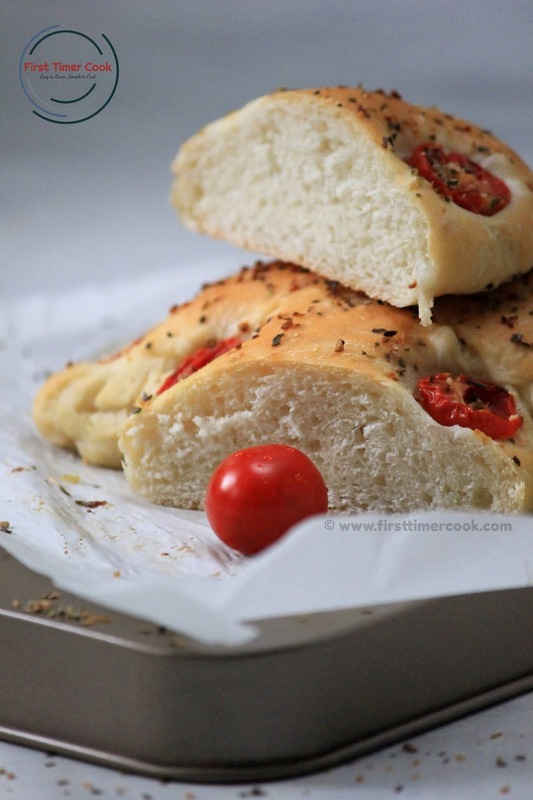 Basically the focaccia is a type of Italian yeast bread and its dough is much similar in style and texture to pizza dough. The focaccia dough is flavored with olive oil most of the time. These breads can be eaten as it is or sliced to have with some soups / salad too. The breads are so versatile means the toppings can be a variety of flavors. Both salty as well as sweet version of focaccia can be prepared and indulged. Here the version which I have prepared is quite simple one and as usual so easy to prepare. Only the time consuming part is the resting time of the dough to proof fully. The toppings are some halved cherry tomatoes along with some mixed herbs. The whole dish is fully vegan and so perfectly fit to be on Christmas special breakfast option. So do try and enjoy each slice. First in a bowl take warm water, sugar and then mix. Add yeast and mix properly using a spoon. Cover the bowl and keep aside for 7 - 8 min till starts frothing. Then in another big bowl take all purpose flour, salt and oil. Mix and next add the yeast mixture. Mix well and knead to make a sticky and soft dough. Cover the bowl and allow to proof by keeping the bowl in a warmer place for 1-2 hours. When the dough becomes double in size, then take out from the bowl. Knead the dough with an oil-greased palm over a board for 1-2 minutes. Shape the dough as a Christmas tree shape or any other shape as desired and place over a baking tray lined with parchment paper. Slice the cherry tomatoes into halves and press in the border area of the Christmas tree shape dough keeping nearly equal space in between. Cove the tray and allow to proof again for at least 1 hour. 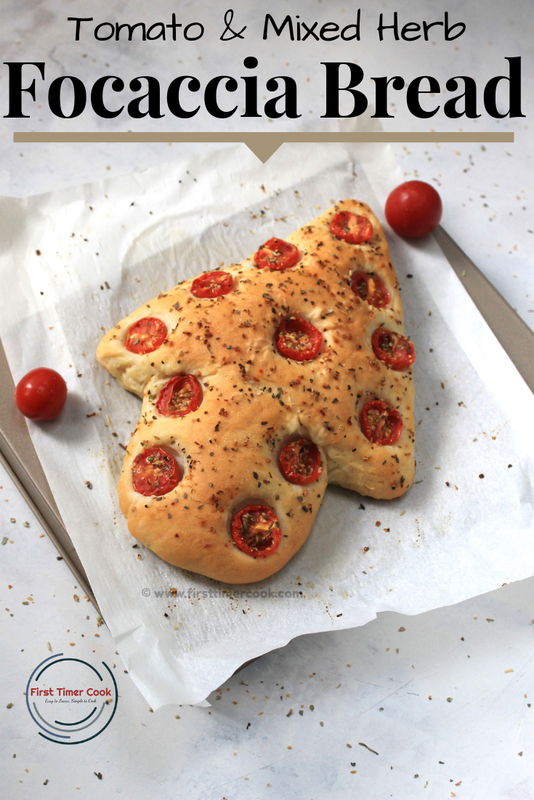 Meanwhile preheat the oven at 200 deg C.
After 1 hour, sprinkle some salt over the cherry tomato halves and mixed herbs on top of the whole dough. Bake for 18-20 minutes or till the top turns golden brown. Cut and serve along with a hot bowl of soup or some salad as desired ! 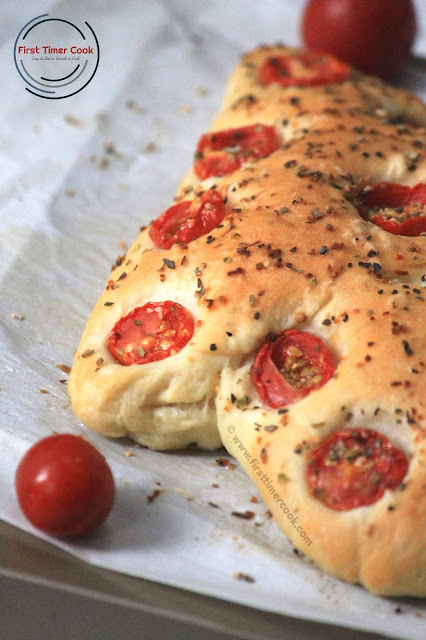 Th herbs can be added directly to the dough as well as used to sprinkle on top to get some extra flavor in the focaccia bread. Tomorrow is Christmas which will be celebrated among billions of people around the world. The year's most celebrated holiday on December 25th is important both for homes and churches worldwide. When the time comes for the winter holidays, the traditional food plays an important part of the celebrations in countries around the world. Christmas celebration means the authentic fruit cake preparation is a must. I have already shared a Christmas fruit cake which is a vegan version and that too in a bundt pan and without using all purpose flour. Well, this time the Foodie Monday Blog Hop team has decided the 176th theme as 'Dried fruits and flowers', means we have to prepare a dish using either dried fruits or dried flowers or both. 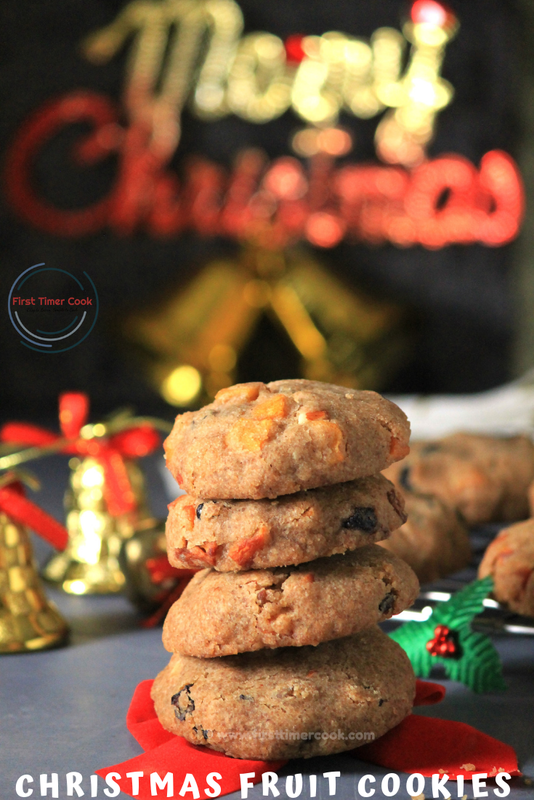 Since Christmas time is this, so keeping the celebration time in mind I have come up with a egg free, butter free and all purpose flour free cookie recipe for the contribution as 'Christmas Fruit Cookies - Vegan version'. 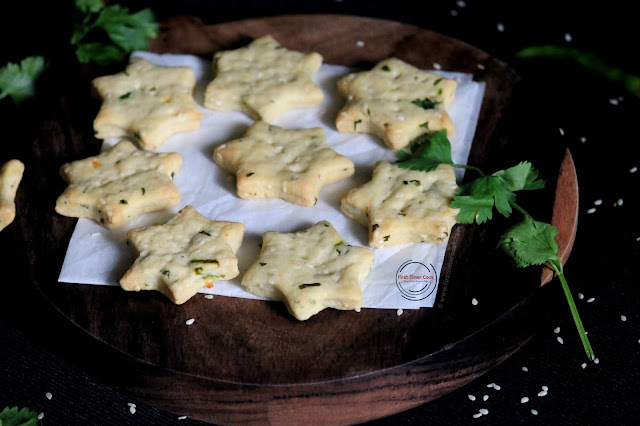 These cookies are completely butter free. I have used olive oil here as the shortening factor. 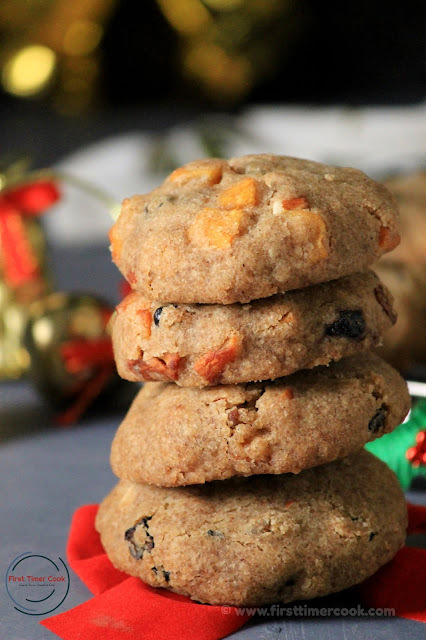 These cookies definitely bring some fruit cake flavor with a crunch texture. Any dried fruits and nuts can be used in these cookies as per choice. To give a healthy angle, the whole wheat flour is opted, but anyone can use the all purpose flour and wheat flour in 1:1 ratio or even the all purpose flour can be used in all total. 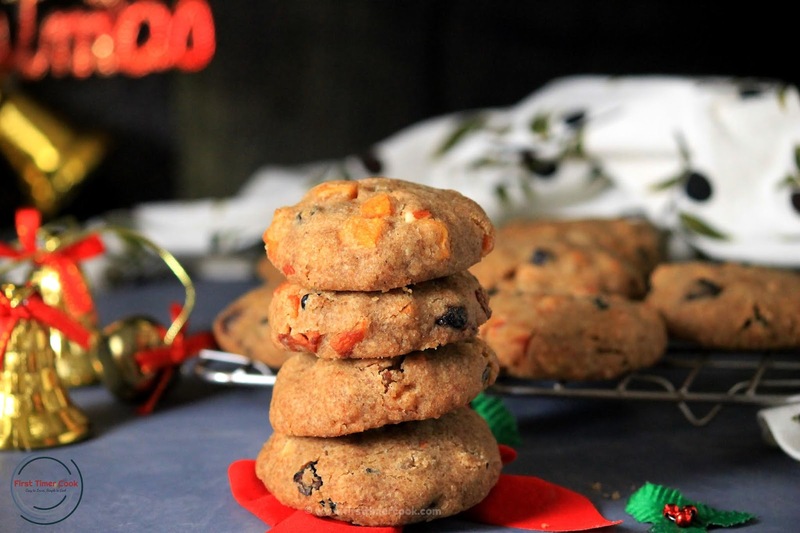 So overall these fruity cookies are egg free, butter free and all purpose flour free. For gifting purpose these'll surely attract by all age group which can be prepared within few times and there is no need of any resting the dough. So do prepare and indulge in some happiness these Christmas goodies. Mix together all the dry ingredients as wheat flour, salt, baking soda, cinnamon powder in a bowl. Keep aside. Next in another mixing bowl take oil, brown sugar and start mixing using a hand whisk till sugar melts completely. Add orange essence and mix well. Add the dry ingredients mixture to the wet ingredient mixture and mix well to get a dough. Now add all the chopped dried fruits, nuts and again gently mix till well incorporated. Scoop up 2 tbsp of the mixture and shape into ball. Flatten slightly and place over a baking tray lined with parchment paper. Similarly make balls from rest dough and arrange on the baking tray keeping some space in between. Take out the baking tray from oven and keep aside for 5-10 minutes. Next transfer the cookies onto a wire rack and allow to cool down completely. Store in an airtight container and serve when desired ! Instead of whole wheat flour, all purpose flour and wheat flour can be used in 1 : 1 ratio. Nuts and dry fruits used here is totally dependable. Feel free to use any dry fruits or nuts. 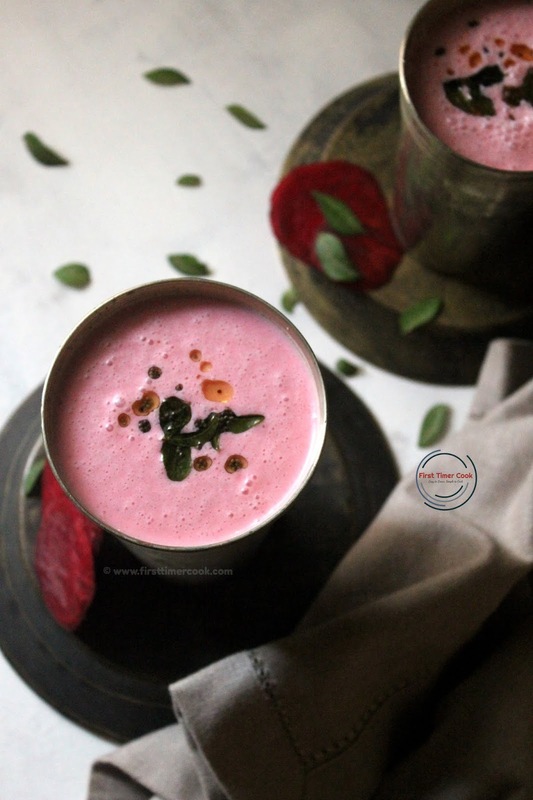 Beetroot or Beet or Chukandar (in Hindi) is typically a root vegetable. Good quality, fresh beetroots should have their green leaves intact. Beets are a low-calorie food packed with a variety of nutrients. The health benefits of beets are wide ranging. Like most other plant-based foods, beets are high in nutrients yet low in calories. The antioxidants content of this colorful root vegetable also offers additional benefits, such as reduced risk of cellular damage, helps to lower the blood pressure, fights inflammation, support detoxification and many more as well. Well the current post is all about a beverage which is being prepared having the main ingredient, Beetroot as 'Spiced Beetroot Buttermilk with Roasted flavor' / 'Bhune Chukandar Masala Chaas'. The hardest and most tedious part here is waiting for the roasted beetroots to cook in the oven. Otherwise the beverage can be prepared within few minutes. Roasting in the oven enhances mostly the earthy flavors in the beet. This beverage is a perfect blend of tasty and healthy factor. 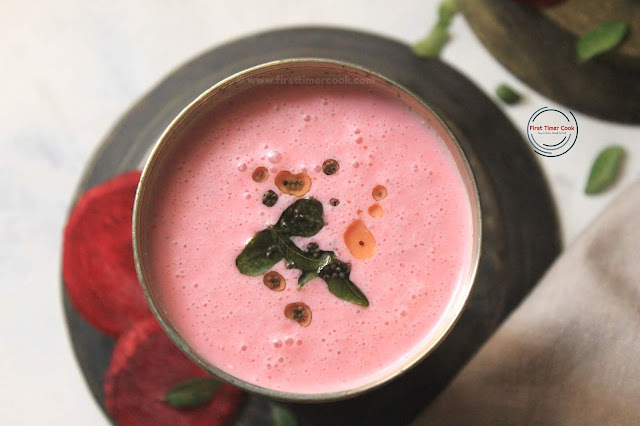 After roasting the beetroot, these are blended well along with some ginger and green chili and then the juice of this mixture is added with curd. Finally a tempering of mustard seed and curry leaves is added to give a masala touch to the whole dish. This beverage has the mix flavor of very mild sweetness which comes from the roasted beetroot and a masala zing from the tempering part. For any party beverage, this will be a sure shot hit in the menu chart. 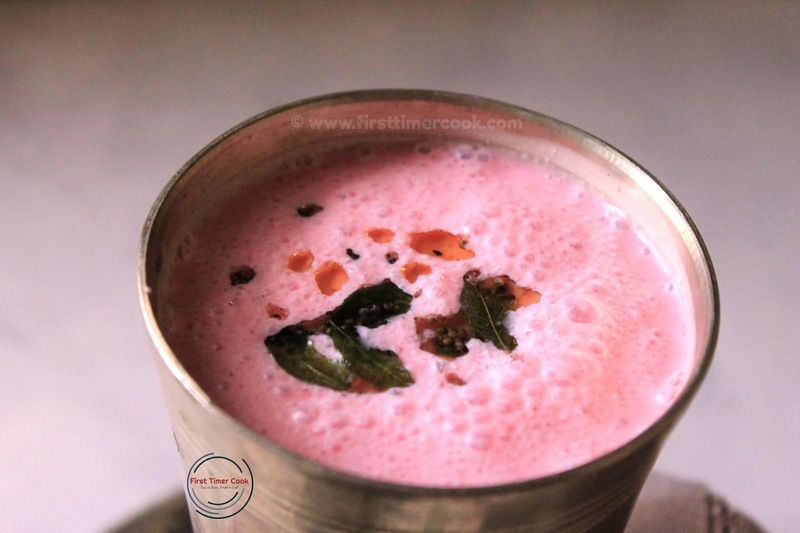 So do try this 'Spiced Beetroot Buttermilk with Roasted flavor' / 'Bhune Chukandar Masala Chaas'. In a blender jar now take roughly chopped ginger, green chili and blend well. Strain the beetroot puree through a strainer into a mixing bowl. Then add curd, black salt and mix using a hand blender or pour into the blender jar and blend. Next heat oil in a tadka pan. Put some mustard seeds, curry leaves and allow to crackle. 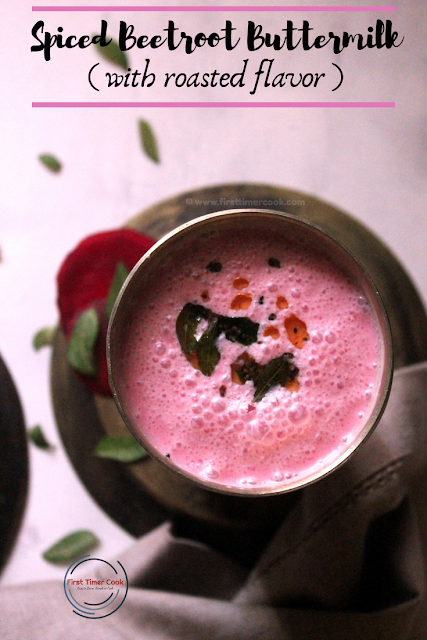 Turn off heat and pour the tempering over the beetroot buttermilk. Mix everything well and serve as it is / chilled ! To get a creamy texture in the butter milk, use the curd after discarding the water completely. In the tempering part, cumin seeds can be added too. Well, Monday is here again !! This time the Foodie Monday Blog Hop team has decided the theme no 174 as 'Christmas Special'. So this 'Spiced Beetroot Buttermilk with Roasted flavor' / 'Bhune Chukandar Masala Chaas' is here for the contribution. 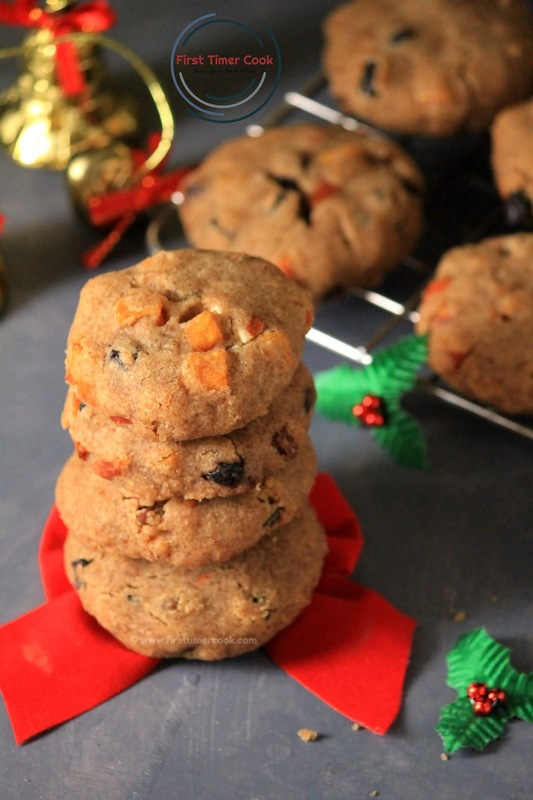 These cookies are completely eggless. Anyone can so easily and quickly prepare. These cookies are flavored with chilies, roasted cumin and sesame seeds, coriander leaves. 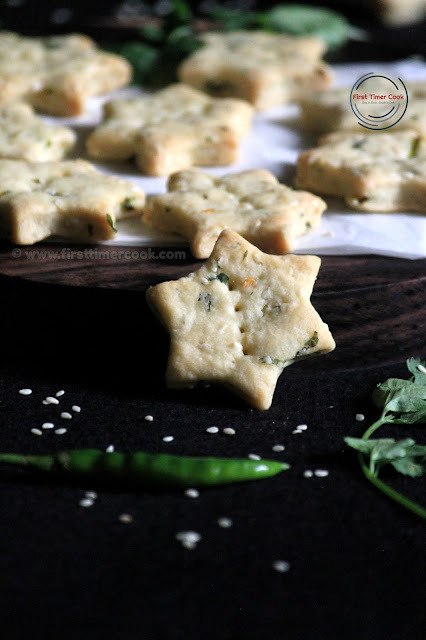 I make very often at my place to savor as it is or with some masala chai. 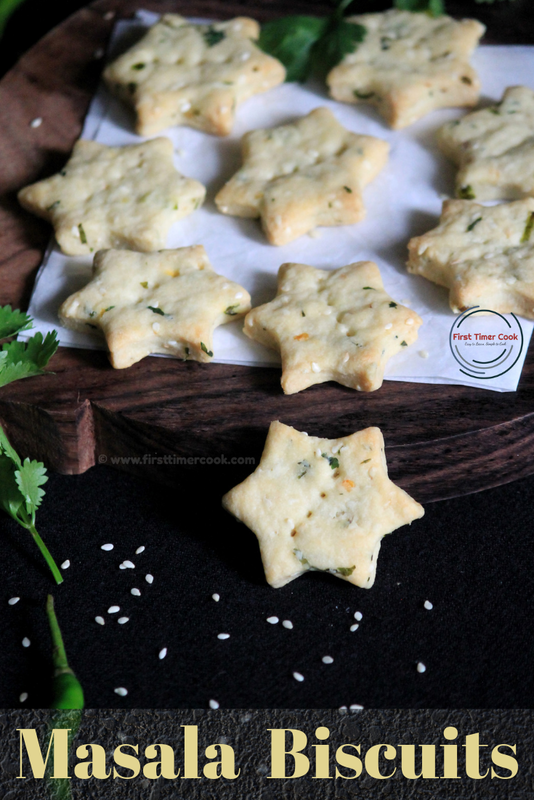 If preferring for kids snacks, then the chilies can be omitted completely. I roast the cumin as well as sesame seeds to get more flavor in the cookies always. 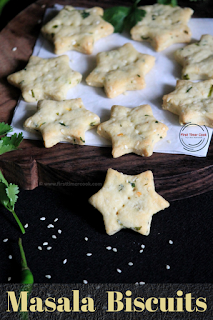 These cookies are so buttery as well as savory in taste. Lets go in details. In a pan first dry roast the cumin seeds, sesame seeds till these are slightly brown and fragrant which'll take around 2-3 minutes. Keep aside to cool down completely. Next in a mixing bowl, cream together the powdered sugar and unsalted butter with the hand blender until both are incorporated well. Now add flour, baking powder, salt and mix to make a soft dough using hand. Then add roasted cumin seeds and sesame seeds, finely chopped coriander leaves and green chilies. Mix again till everything incorporated well. Set the dough for about 10 minutes. Preheat the oven at 180 deg C and line the baking tray with parchment paper. Dust the work surface with flour and roll the dough thin of about 1/4 inch thickness. Cut with cookie cutter with any desired shapes and size. Prick the biscuits with fork to avoid puffing up. Mean while preheat the oven at 180 deg C. Arrange the biscuits in the baking tray having some space in between. Keep the tray in refrigerator for 5 - 10 minutes. Next take out from refrigerator and bake for 14 -15 minutes till they are slight golden from the bottom. Place the cookies on the wired rack to cool down completely. Store in an air tight container and serve when desired along with a glass of milk or chai or as it is ! The baking time may vary depending upon the thickness and size of the cookies. Use butter at room temperature. If preferring for salted butter, then skip adding salt while making the dough. Spiciness can be adjusted as per choice. Cuisines across the world use dates in small and large quantities, but it is also important to note that the fruit of the date palm tree also comes with a lot of health benefits. These sweet fruits are packed with plenty of nutrients, making them an excellent snack in moderation. Dates normally grow on date palms in small clusters. And the term date comes from the Greek word daktulos, which means fingers. 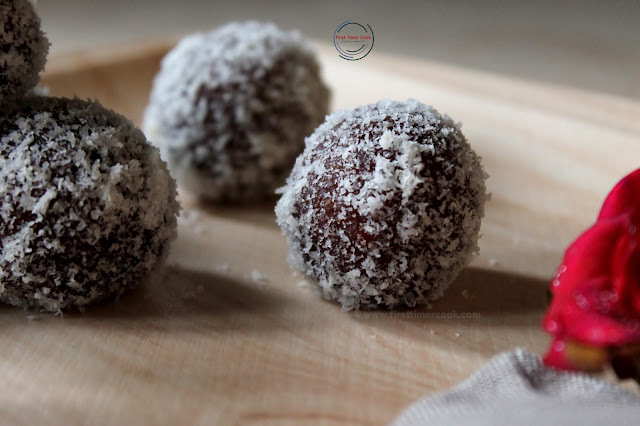 Dates are a good source of various vitamins and minerals, energy, sugar and fiber. It also contains calcium, iron, phosphorus, potassium, magnesium and zinc. First dry roast oats on medium heat for about 5 minutes and then allow to cool down. In a grinder jar, take all the roasted oats and grind to make a powder texture. Add dates, walnuts, almonds and grind again for approximately 10-12 seconds. Do not over grind to make a paste. Transfer the whole mixture into a plate. Scoop out 1-2 tbsp of the mixture, roll in palm and shape into ladoo. 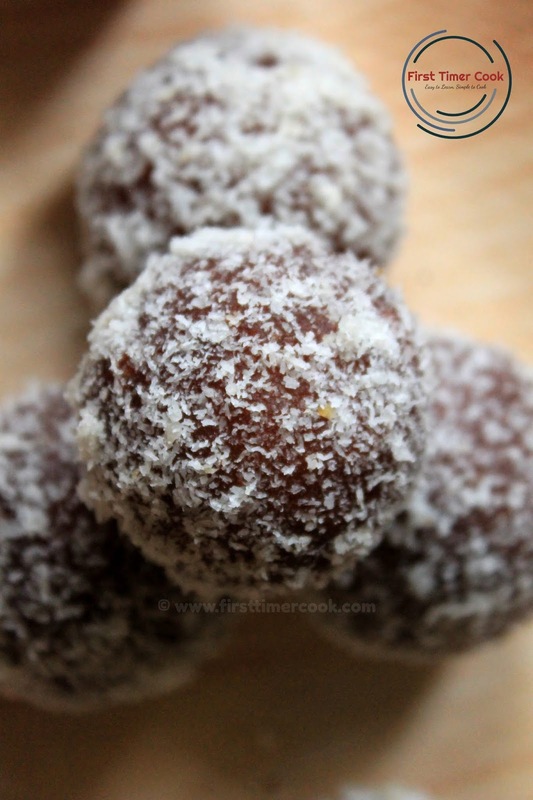 In a plate put desiccated coconut and gently roll the ladoo over it. Enjoy these delectable Date truffles using oats right now or keep in an air tight container for later ! While grinding after adding the dates, if the dough is too wet then add some more roasted oats powder. These truffles'll stay fresh for 3-4 days in the refrigerator. 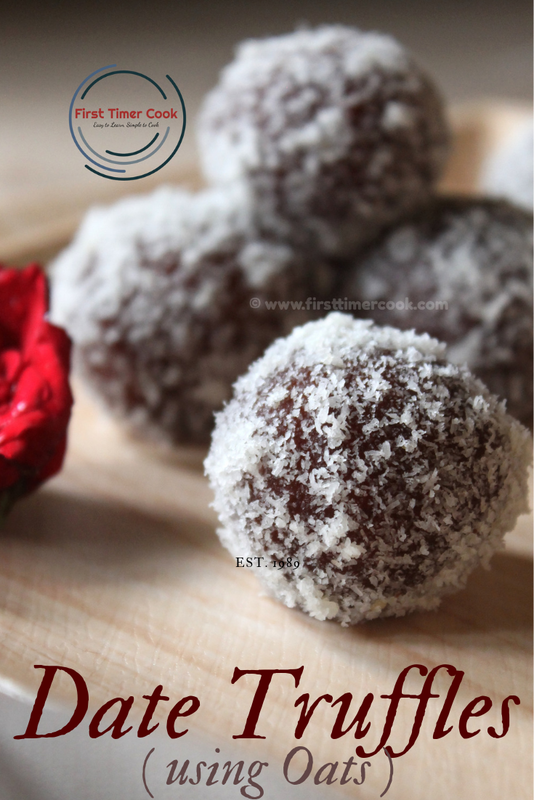 So do try this Date Truffles using Oats. If you tried my recipe and enjoyed fully, then please share some pictures of your creation with me. Also give your valuable feedback either in the comment box below or tag me as #firsttimercook on Instagram. You may also follow me on Facebook, Pinterest, Twitter, Google+, Instagram and can subscribe for free to get new recipes directly into your inbox 😊. Lets go in details. 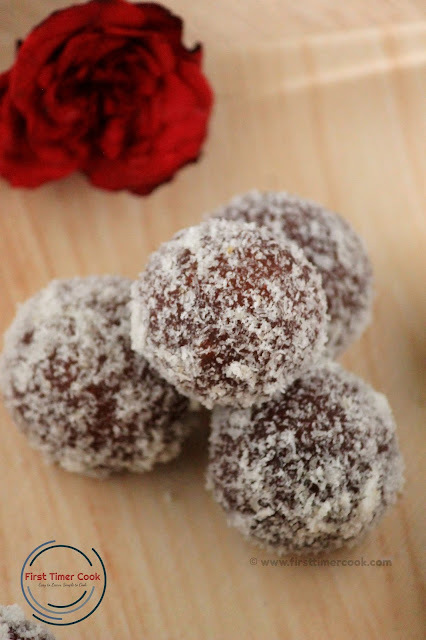 This 'Date Truffles using Oats' is contributed for 58th Healthy Wellthy Cuisines where the theme is 'Nutty Nut at HW'. 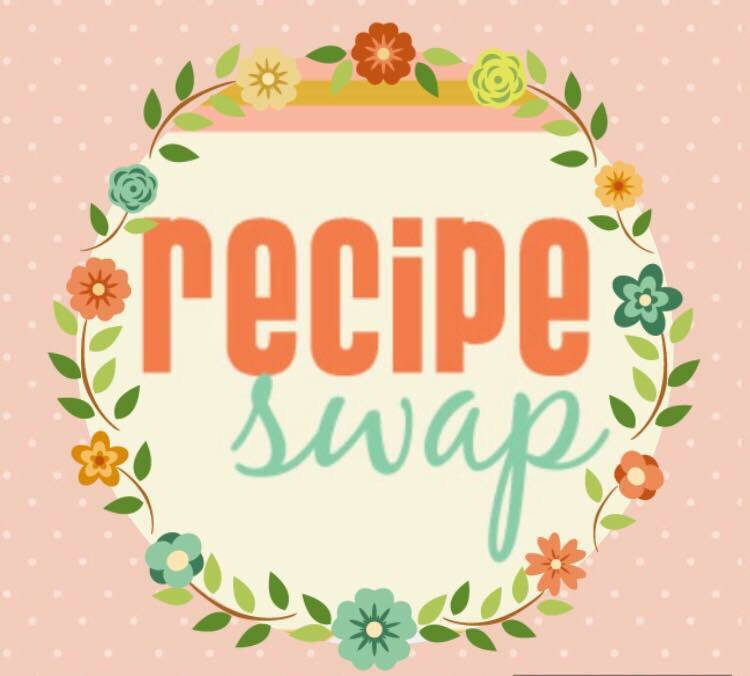 Here are more similar recipes shared by our Healthy Wealthy Group members as Masala Kaju in microwave, Badam Puri, 5-Minute Pavlova Parfait, Nutty Fruity Cookies, Shahi Mewa Korma/ Royal Nuts Curry, Healthy Homemade Granola, Fruit and Nut Raita, Monaco Mango Bites, Zarda Pulao .